Gerhard Maletzke is a clear example on the influence of Mass Communications Re­search in German Mass Communication Science. In 1963 he translated several of these investigations to German in a voluminous work entitled Psychology of Mass Communication (translated to Spanish by Ciespal editorial in 1970) in which he published his communication model. Maletzke starts from an elemental scheme which progressively increases in complexity until it reaches the model which graphs the process of social communication (See Figure). Communication can be conceptualized, initially, as a message (M) issued by a communicator (C) which results in an experience (an effect) on a receiver (R). 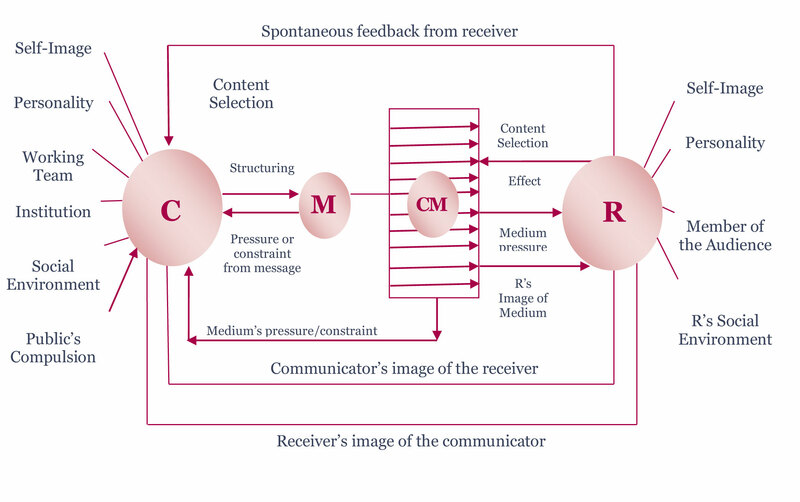 In social communication, the message reaches the receiver through a communication medium (CM). Each medium has technological features that affect the perceptual process, on experience and on the effects that it produces on the receiver. In today's society the media's communicative offer is enormous. Therefore, the receiver must perform a selection of the medium he will pay attention to. Thus, the receiver takes an active role in the social communication process, determining which messages are the ones that will produce an experience on him. The receiver is not an isolated individual. He is integrated, on one hand, in many social relations, and on the other hand, he is part of a dispersed public. Furthermore, the receiver's view of himself, of his situation, of his role and functions in the social system also intervene on the effects. Likewise, the technological characteristics of the chosen medium determine the modes of behavior and experience of the receiver. Maletzke points out that the receiver is under the "pressure and constraint of the medium". Finally, the receiver has an image of the medium. Authors / References: Gerhard Maletzke. © 2003-2016 Comunicologos.com. Todos los derechos reservados.